Credit: From the book Landscaping from the Ground Up by Sara Jane von Trapp - The Taunton Press, Inc. Does your garden need a little dressing up for winter? It is cold and snowy outside, but winter doesn’t need to be a boring time in the garden. With just a little extra attention, you can select plants that add details to your landscape. Textures, colors, and movement can make your garden beautiful in winter! To inspire you, we thought we’d share a few pages from the book Landscaping from the Ground Up by Sara Jane von Trapp, Bartlett Arboretum & Gardens CEO. Jane shares some of her favorite winter plantings that add winter interest to any garden. 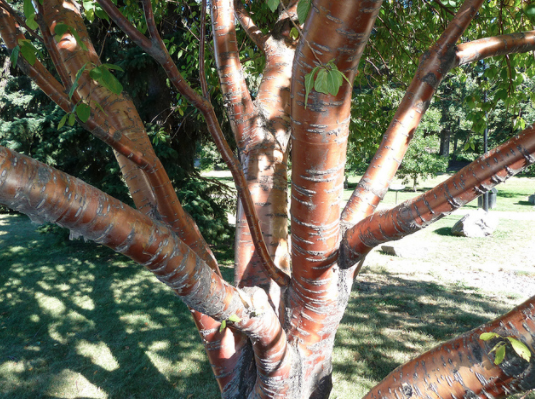 For an interesting, upright focal point in a large planting bed, Prunus maackii (Manchurian cherry) is a good choice. Its shiny, rich, red-brown mahogany bark peels just like a birch tree, and against the white of snow, it glistens. It is extremely hardy (Zone 2), blooms white flowers and small black fruit, and adds yellow color to the yard in the fall. More common Cornus alba ‘Sibirica’ (tatarian dogwood) and Cornus stolonifera ‘Flaviramea’ (yellow-twig dogwood) are large, vigorous shrubs. They are perfect choices for an island planting bed in the yard or for a hedgerow. With chalk-white stems and yellow, edible berries, Rubus biflorus (twin-flowered raspberry) can add a ghostly touch to a red-brick wall. Any planting bed would benefit by the addition of ornamental grasses for their striking autumn wheat color and wispy, feathery dried flowers that hang on through winter. Miscanthus spp. flowers look like miniature brooms, and Contaderia selloana (pampas grass) moves like graceful plumes in the breeze. Pennisetum spp. is bottle-brush-shaped, and Festuca spp. flowers are loose and spikey. You’ll find many sizes and cultivars for grasses, but choose appropriately for your hardiness zone. The usually bronze-green leaves of PJM rhododendrons turn reddish purple in the fall and hold their color through the winter. Many junipers become a lovely plum-purple color when cold weather sets in. Low, spreading types are appropriate for the front layer of a planting bed. Yellow-foliaged evergreens like Chamaecyparis pisifera ‘Filifera Aurea’ are striking focal points in the winter garden, still layered with that fan-shaped foliage. One of my passions is weeping trees, and there are no better architectural plants for winter appeal. Betula pendula ‘Youngii’ (Young’s weeping birch) has white, peeling bark, dark-brown stems, and twigs that cascade in streams from the mushroom-shaped head to the ground. Some of my other favorite deciduous weeping trees include Ulmus glabra ‘Camperdownii’ (camperdown elm), Caragana arborescens ‘Pendula’ (weeping Siberian pea), and Fagus sylvatica ‘Purpurea Pendula’ (weeping purple beech). For cookscrew-branched sculptural specimens, there are none better than Corylus avellana ‘Contorta’ (Harry Lauder’s walking stick) and Salix x erythroflexuosa (corkscrew willow) with orange-yellow, pendulous, twisted, and contorted stems. Harry Lauder’s can be kept under control as an addition to a foundation planting bed, but the willow is best planted out in the yard. The classic winter garden show features fruit in many colors: red, orange, yellow, blue, black, and white. The attraction draws furry and feathered guests, as well as our eyes, to feast. Pyracantha coccinea (fire thorn) is abundant with red (P. coccinea ‘Watereri’), yellow (P. coccinea ‘Shawnee’), or bright orange berries (P. coccinea ‘Mohave’) and can be grown as a shrub or pruned and trained into an espalier or bonsai specimen. For huge clusters of red fruit, Ilex verticillata ‘Sparkleberry’ (winterberry) is unmatched, but it needs a pollinator to produce (try I. ‘Apollo’) and space to grow. It is best planted along the edge of the yard or in a woodland garden. Tiny, abundant, persistent, hanging crab apples are a key feature in a winter garden. My favorite is Malus sargentii (Sargent crab), which has a very horizontal branching habit and remains dwarf, providing a very architectural element as well. As long as enough space is left for Sargent crab to spread its 8-ft. to 10-ft. branches horizontally, its height, at 6 ft., will not intrude but will be a highlight in a foundation planting bed. Use low-growing perennials and ground covers to fill the space beneath its branches. And don't put a bird feeder nearby because the apples will be favorites for wildlife. Viburnum trilobum ‘Alfredo’ lives up to its common name, cranberry bush, by sporting large, shiny, clusters of edible, bright-red berries, perfect for jams and jellies. It stays 4 ft. tall and has brilliant red fall color as well. We hope you are inspired to add winter interest to your garden. What are your favorites?